To celebrate PADI 5 Star IDC Sairee Cottage Diving’s 10 year anniversary they put together the ‘Change a Life’ contest. One lucky winner would win an all-inclusive (zero to hero) PADI Divemaster package. Not only did this package include all PADI courses from Open Water Diver up to Divemaster, but it also included flights, accommodation, learning material, insurance, unlimited fun diving, gear rental and more. I finally decided to enter the competition and began writing a blog post and filming a video to submit. A few weeks and one video interview later, Sairee Cottage Diving’s PADI Platinum Course Director, Marcel van den Berg, messaged me to let me know I had actually won the contest! After totally freaking out, I immediately started looking for flights. With my flights booked for the 22nd July, I couldn’t wait to go on my biggest adventure yet. Being the lucky winner of the Sairee Cottage Diving ‘Change a Life’ competition, I won an all-inclusive PADI Divemaster package. Although I originally never imagined myself as a PADI Divemaster, I was excited to get started. I travelled to the beautiful island of Koh Tao, where I visited Sairee Cottage Diving. It was here that I was lucky enough to start a new chapter of my life as a PADI Divemaster, while living in paradise. My life was quickly filled with beautiful beaches, warm weather, amazing people and a lot of unforgettable diving! Since travelling to Koh Tao and meeting the team at Sairee Cottage Diving, a lot has happened. I completed my PADI Advanced Open Water Diver, Emergency First Response and PADI Rescue Diver courses and I am currently on the journey to becoming a PADI Divemaster. Most people I talk to ask me if I can teach students how to dive after completing the PADI Divemaster course, but the answer is simply no. To teach students how to dive you must first complete the PADI Open Water Scuba Instructor program. Instead, as a PADI Divemaster you can take already certified divers on guided tours (fun dives) despite their certification level (Open Water Diver and above). A Divemaster is simply an underwater tour guide that can show divers local dive sites, local marine life and basically anything interesting underwater. Learning great buoyancy skills in my PADI Divemaster Course. To become a PADI Divemaster you must first learn various demonstrating skills, theory about your equipment, human physiology, physics, and decompression and recreational diving. You must be able to prove your swimming, floating, snorkelling and towing abilities. To deepen your rescue, navigation, buoyancy and mapping skills, you must also attend workshops. Finally, you will also need to assist instructors on various courses. Besides all that, a huge part of the course is fun diving so you can perfect your confidence underwater and of course, your diving skills. Here at Sairee Cottage Diving, they emphasise that your Divemaster course is about having fun – and it absolutely is! One thing that makes this humbling experience of discovering this whole new world, even more fun, is that I get to share it with so many other passionate divers. 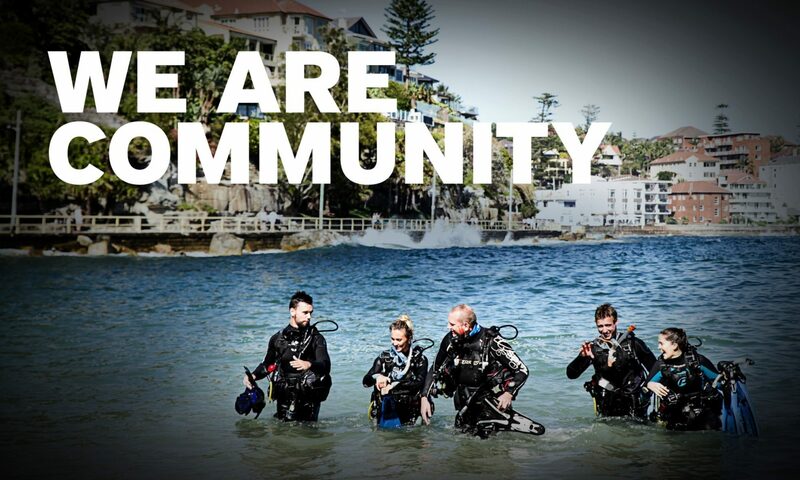 The PADI diving community is literally just as diverse as the Koh Tao marine life. You’ll meet people of all ages, from all over the world, with the most diverse backgrounds, yet they all have a shared love for diving. I have learnt so much from just talking to them about what we’ve seen underwater during previous diving experiences. Being surrounded by those inspiring people and hearing their experiences have helped (and still help) me a lot with progressing in my own diving career. For example, I have been able to overcome my small fear of night diving by realising that with the right training, a night dive can be a very special and meditative experience. Recently a friend of mine asked me about my most memorable experience in diving and I thought back to my first week on Koh Tao. Together with some other divemaster candidates, I went on a fun dive at a dive site called South West Pinnacle. It was a nice, sunny day and the visibility underwater was great. We were just hovering around the pinnacle enjoying ourselves when a giant school of beautiful gold band fusiliers came in sight. Those small, agile fish were everywhere, surrounding us from every side, moving whenever we moved. Some of them even came very close which made the experience of being a part of this community and one with the environment, even more exciting. It absolutely made my day and it still puts a big smile on my face today. Another dive I will never forget was when we saw a whale shark. It was so unbelievably exciting to see the stunning whale shark swim gracefully in the distance. Whale shark encounter during my PADI Divemaster Course on Koh Tao. Putting a big smile on someone’s face and experiencing these amazing memories with them is why becoming a PADI Divemaster is so special. You are able to show them the marine life that they see on television, in front of their own eyes. Sometimes I catch myself taking all this for granted, as it has become a part of my everyday life. However, I keep reminding myself that the opportunity I was given comes as a once in a lifetime experience and I am incredibly thankful for that! It’s hard to put my thoughts and feelings into the right words, as there is so much more to tell. However, that’s why I am sharing my experience of my PADI Divemaster journey and the amazing lifestyle that comes with it. Are you interested in becoming a PADI Divemaster like Christina? Learn more about the PADI Divemaster course, PADI Open Water Scuba Instructor course and locate your local PADI Dive Store in Koh Tao today!